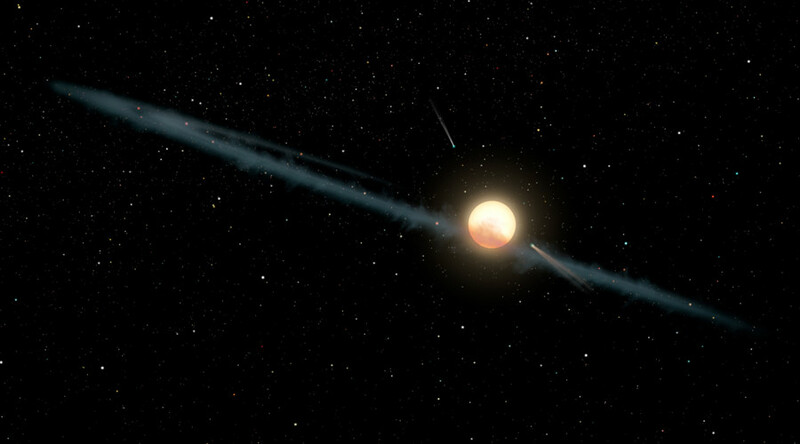 Strange long-term light patterns around a puzzling stellar object 1,300 light years away may actually be caused by orbiting dust, and is unlikely to be the result of an ‘alien megastructure’, scientists believe. An unusual theory surrounding the fluctuating brightness of KIC 8462852, also known as Tabby’s Star, is that the object could be in close proximity to an alien spaceship lurking in the Cygnus constellation. In 2011 and 2013, the light shining from the distant star dropped by 20 percent for a brief period, leading to bountiful speculation as to why. One of the theories spread online was the idea that a massive alien craft was to blame. Well now a new study using NASA’s Spitzer and Swift telescopes has indicated that the light patterns previously observed are much more likely to be from an uneven dust cloud orbiting Tabby’s Star. The particles, when uneven, would have the ability to dim ultraviolet light at different levels while passing over the blazing star. From October 2015 to December last year, the researchers employed ultraviolet and infrared telescopes to observe the phenomenon. After witnessing a strong ultraviolet dip, it was surmised that the most likely cause was large particles known as circumstellar dust. The size of the dust means it could conceivably become wrapped up in Tabby’s Star’s orbit. According to NASA, a swarm of comets passing the star in 2011 and 2013 may also have contributed to the changing light. The new study on the star, entitled ‘The Extinction and the Dimming of KIC 8462852’, has been published in the Astrophysical Journal.